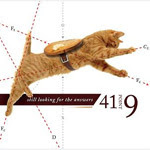 RockUnitedReviews: 41POINT9: "Still Looking For Answers"
Anyone for Pop friendly Prog?? Sure, why not... as long as they're mixing things at this remarkable high level which include a fine texture and interesting rhythms. To be completely frank, we're all pretty fed up with all the extremely boring acts who merely play a third rate version of Dream Theatre arranged music anyhow. Indeed, thus why 41Point9 strikes me as something completely different, out-of the-box, possible even new and fresh? The stunning new project by Brian Cline, original singer/bassist with Enchant and his partner-in-crime, Bob Marsden of Xen and Enchant fame. Add to this guest performances by Nick D'Virgilio and Jimmy Keegan of Spocks Beard and an eighties pop sound in everything from the production to rhythm section. Oh shut up you infront of the pc with the cheeky remark - any serious 4-string player knows that Level 42, Japan, Kajagoogoo, had some of the most interesting bass-lines around in the eighties. If not, bow yer head in shame. Hi-tech prog? Well, it's almost like if they're shaking the tree just to see what comes out and down to the ground. Have a go at this apple if you fancy a fun and rather vivid mix of (new) Marillion, Midge Ure, Peter Gabriel, Level 42, Porcupine Tree and Japan. Recommended.